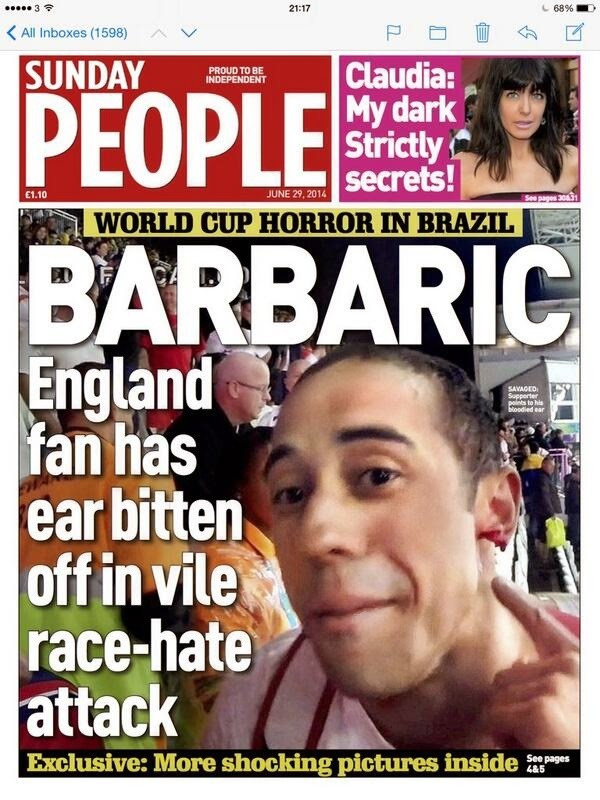 The British media are reporting of a horrific incident, The Sunday people in particular got their hands on a shocking picture showing an England fan with the lower part of his ear bitten off. Robert Farquharson was attacked in the Arena Corinthians stadium after England’s 2-1 defeat to Uruguay – five days before Luis Suarez bit Italy’s Giorgio Chiellini. An England football supporter had a piece of his ear bitten off by another England fan at the World Cup in Brazil. The assault happened during England's match against Uruguay in Sao Paulo on 19 June, British police deployed to the tournament have said. Local officers started an investigation after the fan made a complaint but the assailant has not been identified. Confirmation of the incident came after radio pundit Stan Collymore tweeted he had seen footage of a "fan attacked". Six British police officers have travelled to Brazil for the tournament. Their role is to to offer support and advice to Brazilian police and local authorities as well as overseeing the thousands of England fans who travelled to the country.